Community gardening has become popular again, so community orchards are being created on allotment sites, in parks and other public places, and at schools and colleges. It’s important to remember that an orchard requires maintenance: trees need large planting holes to be dug and must be staked when planted (often in the depths of winter), they must be pruned and checked for disease or damage, above all fruit must be harvested and the produce that is collected has to be eaten, or stored, or processed for later use. If the downsides don’t put you off, fruit trees can be beautiful, relatively long-lived and hardy, and very practical. In temperate, non-tropical regions, orchards were traditionally placed near bodies of water to try and limit exposure to frost, and laid out in a rectangular grid-like formation adapted from the designs used in medieval monasteries which were, in turn, an interpretation of heavenly gardens as seen in the Books of Hours (prayer books). Having grass or bare soil under the trees is a classic feature which allows easy maintenance: pruning, treating for insects etc, and fruit collection. There are two forms of modern orchard garden: the permaculture garden, often seen on allotments and organic farms, and the multipurpose orchard. Permaculture Orchards: Creating a permaculture orchard means choosing a blend of food trees and other trees that have value for medicine, cosmetics, wildlife or beauty. As an example, a lilac tree may be used to attract pollinating insects, to harvest blossom for the home and to make toiletries using the scented flowers – so although it is not a traditional orchard tree it has great value in an permaculture orchard. Underneath these non-fruiting trees it is usual to plant flowers or crops that can be harvested: so a lilac may have an under-planting of spring bulbs to look pretty or edible flowers such as nasturtiums, or the planting may be a low-growing shrub like a cranberry to provide a crop, or an annual grass like millet offering winter seed to birds that are valuable to the orchard. In a permaculture orchard, every centimetre of space will be utilised, including walls and fences which support espaliered fruit trees, vines or blackberries. A permaculture orchard often has beehives to add to the productivity of the space. Multipurpose Orchards: The classic monastic pattern of orchard design has become the starting point for many different styles of orchard gardening, including hexagon layouts with a central barbecue, summer house, table or paved area, or the ‘walking orchard’:a rectangular space with trees along each side, providing open ground in which children can play, washing can be dried, or people can walk or exercise. Combining the practical and the attractive with the lifestyle of the user/orchard owner can create orchard gardens that will have decades of useful life and may even feature a design that allows for less mobility in later life or for a treehouse to be built for future children/grandchildren! Orchards can be created in most soils but where there is heavy clay, some soil remediation at depth will be needed to stop waterlogging which can kill trees at the root. Sandy soil can also present a problem, especially with larger trees which can develop root rock if the soil is very friable, but this can often be resolved by building good walls or fences around the orchard in the traditional fashion. 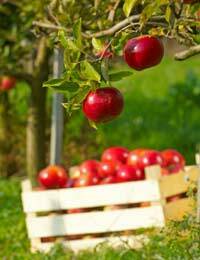 It’s vital when designing an orchard garden to ensure you plant varieties you are going to enjoy eating or giving away: there’s not a lot of point investing in a tree that you won’t love. Focus on disease-resistant varieties as it’s devastating to plan a garden that is then damaged by blight or fungus or the depredations of an insect that consumes your crop. Pollinators are important – some fruit trees, and almost all bushes, are self-fertile but not all, and you may need to buy trees that share the same pollination period if you cannot establish whether suitable pollinators are available within insect flying distance. The National Fruit Collection at Brogdale in the UK is a world-renowned resource that maintains many varieties of rare, old or specialised fruit which can be particularly suited to unusual conditions such as urban areas, wet soil or windy sites. They offer an advisory service for both purchasing and planning. If you are planning a permaculture garden, design the under-planting so that the tree’s canopy (the spread of its branches and the density of the leaf cover) does not interfere with the growth pattern of the shrub or flowers underneath.